As Spring approaches you may be contemplating your next challenge and thinking about your personal athletic goals for the 2016 season. The winter has been great for off-season training, but now it’s time to buckle down and start setting your sights on a specific target or two. 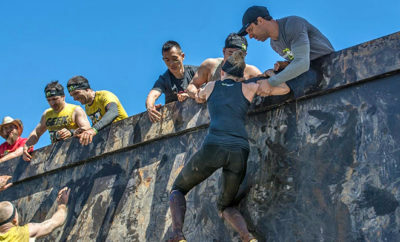 Maybe you’re a runner, obstacle racer or fitness fanatic, and are looking for something a little different. I started off as a runner, but after I‘d completed three marathons, I realized that I needed to diversify and cross train in order to save my body from the risk of over-use injuries. An athlete friend suggested that the natural choice for me would be to progress from the running world into the triathlon scene. However, I knew nothing about triathlons: I had never ridden a time-trial bike (or even a road bike for that matter). Neither had I swum in anything other than a backyard pool, never mind in open water! On the other hand, as a “veteran” of three marathons, I thought how hard can it be? I soon found the answer to that question when that same friend told me about the Ironman: a triathlon which has to be completed in 17 hours or less. It starts with a 3.9km open water swim, followed by a 180 km bike and ends when you THEN run a 42.2km full marathon. Clearly totally grueling, but maybe something that I would do! My family and friends quickly told me I’d be crazy to attempt it: who would want to do anything for 17 hours, let alone swim, bike and run for that long. That made me realize just how special this event was … a challenge that most people I knew couldn’t imagine anyone doing. I was sold …. I was going to do it! I was going to be an Ironman: come what may. A few days later I signed up to race on behalf of Team Diabetes at Ironman Canada, to be held out West in beautifully hilly Penticton, BC. From that point on, there was never a moment when I did not think I could do this. I was all in and 100% committed to achieving the goal of becoming an Ironman. Fast forward ten years later and I’ve completed six Full Ironman and ten Half Ironman races. Last year I made it to the Half Ironman World Championships held in Austria, racing alongside the best athletes in the world, having qualified at Ironman 70.3 Oceanside, California. Over the years I’ve learned a lot about conserving energy and building endurance, selecting the best courses and conditions to play to my strengths, and experimenting with how best to take in the large amount of nutrition necessary to sustain oneself during such a long race. Take it slow and steady. Devise a game plan to get to the finish line. If your goal is to complete an Ironman, work your way up to this distance gradually. The good news is that triathlons come in lots of shapes and sizes. The most common mistake is trying to go too far too fast. I had a friend that thought he could jump in and complete a full Ironman on his general athleticism and willpower alone: he ended up in the medical tent! So start small with an entry level “try-a-tri” triathlon, then progress through the longer distances: sprint (750m swim-20km bike-5km run), Olympic (1.5km swim-40km bike-10km run) and Half Ironman (2km swim-90km bike-21.1km run). Use each race to build your endurance, test your limits and learn how to pace yourself through the three legs so you finish strong. Have a solid, detailed daily training plan. As my misguided friend found out to his cost, you can’t fake an Ironman: this is definitely not an event you can just wing! I would highly recommend seeking out a professional triathlon coach to help you achieve your goal. I found it was really helpful to have a coach map out a daily plan for me, tailored to my abilities at the time, based on tried and tested training methods. That way I didn’t have to think about what I should be doing on any given day, I just had to do it! A local coach will also provide much-needed advice and support when you need it the most and will often have group rides, runs and swims for their athletes. Experiment with your nutrition – work out what your body can handle in terms of replenishing your electrolytes and the thousands of calories you’ll be burning up during the race. There’s an amazing array of products on the market designed for this purpose and they come in all forms: powders, liquids, bars, gels and gummies. My recommendation would be to try out different products during your longer training sessions and find the right combination of what works best for you. Everyone tolerates the stress of riding and running while eating and drinking differently. What sits well in one person’s stomach on the run can cause extreme gastric distress in another. You really need to try the various options and select what works for you. Some people choose peanut butter and jelly sandwiches washed down with Red Bull, but personally I wouldn’t recommend it! Invest in quality triathlon attire. Given the amount of hours that you’ll be logging on the bike it’s a good investment to purchase padded bike shorts for training and some lighter faster triathlon shorts for racing and shorter distances. You should also buy some lubricating gel like Aquaphor to eliminate the friction between your delicate parts and your race clothing. Trust me on this one ladies! You’ll also want to get some “speed” laces which are elasticated and don’t need tying, so that your running shoes are easy to put on in transition. If you’re serious about your training and want to track your heart rate and pace, invest in a good GPS watch: it’s an invaluable training tool. And don’t forget you’ll need the warmth and extra buoyancy of a good fitting wetsuit if you are planning to enter one of the many races held in open water where the temperature is less than 25 degrees C! Get comfortable swimming in open water well before the race. Many see this as the toughest of the three triathlon legs, and it’s the one that convinces the most people that they simply can’t do it. I would highly recommend joining a triathlon swim group where you’ll get assistance with your technique, meet other fellow triathletes and learn to get comfortable swimming alongside others in a lake or ocean. Purchase the right bike for your ability and body type. Starting off, I bought a road bike and was thankful I did, never having been clipped into pedals before other than in a spin class. The geometry of a road bike is much easier and safer to handle. My next step was to add aerobars to the bike which enabled me to get into a more aerodynamic riding position. Eventually I progressed to a “tri bike”, having got comfortable riding like a roadie. The best piece of advice would definitely be investing the money into using a qualified professional bike fitter to fit you properly to your chosen bike. There’s little worse than riding over 100km with muscle cramps caused by an ill-fitting machine! Also make sure that you have a full repair kit on your bike in case you get a puncture. I raced the Muskoka long course triathlon one year and had two tire flats in a row. I was very fortunate that a guy stopped, gave me his spare tube and helped me fit it. Yes, sometimes it is an advantage to be female and clad in tight spandex shorts! Practice your transitions. Much time can be gained or wasted as you move from the swim to the bike, then move to the run. So practice coming out of the water in your wetsuit, running to your transition area, quickly getting into your bike gear (while still wet!) and mounting your bike safely. Do the same for your transition from bike to run. Practice makes perfect so that your transitions go seamlessly and you won’t forget anything! The key is to keep it simple and smooth … the less items you have to contend with the better. Tip: ensure you have your nutrition already loaded on your bike. Incorporate strength training into your routine. Many triathletes only use the off season to work on their weight and strength training. I encourage you to include a full body weight routine twice a week as part of your weekly training. It will help you to become fitter, stronger and ultimately faster! Select the best race for your strengths. Once you’ve decided which distance(s) you’d like to race then it’s time to do some research on where you would like to go to accomplish your goal. You could try out a few shorter local races first or travel a little further to an exotic destination. I personally found the flat warmer climates the best racing conditions for me to capitalize on my strengths. After my first Ironman I was hooked, and I wanted to sign up for another one right away. So I went onto the ironman.com website and started looking for the races available during the months that worked with my business schedule. You’ll find this website a great tool if you want to complete a half ironman or a full ironman. Another great resource is mynextrace.com where you can find triathlons for all distances in every province and many countries. Travel as early as possible to your races. Particularly if you have selected an “away” race far from home, make sure you leave extra days to compensate for any travel glitches and delays and to allow your body to adjust should there be significant time and/or temperature differences. If you have to fly to your destination, put all your race essentials (wet suit, helmet, bike and run shoes, tri-top, shorts and nutrition) in your carry-on bag. Traveling with your bike on the plane is an option, but a better one where available is to use Tribike Transport (TBT). This is a door to door service that picks up your bike from your local bike store and delivers it to you at the event location. After the race, you simply drop it back off with them and viola it shows up at your bike shop a few days later. At first glance, TBT’s service may seem expensive, but unless you have already a bike travel box and are a competent mechanic, it’s worth the money. It’s a lot less hassle and often actually works out cheaper than the alternative of paying your local bike shop to take apart and pack your bike, paying the airline the frequently extortionate over-size baggage fees, and paying another bike shop at your destination to re-assemble it. You then have to repeat the same process after the race of course. However you and your bike travel, you’ll find a support crew of family and/or friends invaluable, particularly for the long distance events. You’ll really appreciate those extra hands as they help you with everything from shopping for food to carrying your gear, and lift your spirits as they cheer you on to the finish. I’ve been very fortunate to have my wonderful parents come to all of my races and support me in this way. There is one nitty gritty detail that others might not tell you about. You may wonder how you’re going to handle the consequences of drinking all the water you need in order to stay properly hydrated, which it is essential to do during the race. Litres of water in means litres of water out! Now you can always stop and use one of the port-a-potties on the course. However, they are inevitably gross and there’s often a line-up. So you waste valuable minutes waiting for an unpleasant experience during which time you risk your muscles stiffening up or cramping. A more practical option is to do like the pro’s and discreetly pee down your leg while riding and running. Even though it sounds nasty, if you’re drinking the right amount it’ll be pretty much just clear water. So just relax and learn to let it go! Whatever distance and intensity of competition you choose, be sure to have fun! 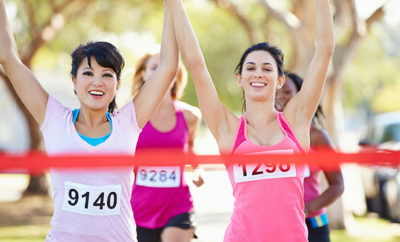 Train with local triathlon groups or friends, enjoy the moment and don’t forget to smile as you cross the finish line!